Nuts are convenient foods that provide several essential nutrients and may have a variety of health benefits as part of a balanced diet. Almonds are the nuts with the highest amount of dietary fiber, pecans are among the top sources of monounsaturated fats and walnuts provide omega-3 fatty acids. 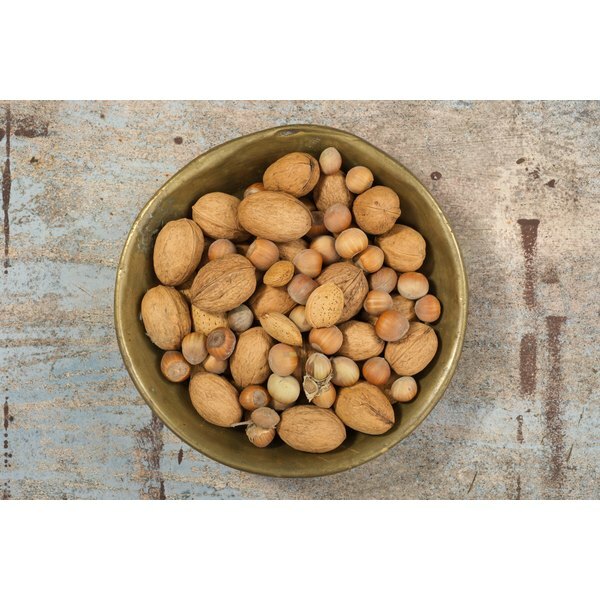 Eat these nuts on their own or in trail mixes as a snack, or eat them at mealtimes in salads or cereals or with chicken or fish. Regular nut consumption may lower your total and LDL cholesterol levels and reduce risk for developing heart disease. The high ratio of unsaturated to saturated fatty acids in almonds, pecans and walnuts may contribute to this benefit. Walnuts also provide alpha-linolenic acid, an omega-3 fatty acid that may increase healthy HDL cholesterol levels. Dietary fiber is another component in nuts that can lower LDL cholesterol levels. Almonds are highest in fiber, with 3.5 grams per ounce. An ounce of walnuts has 1.9 grams of fiber, and an ounce of pecans has 2.7 grams of fiber. People who regularly eat nuts tend to have lower body weights than people who avoid them, according to the "British Medical Journal." The Linus Pauling Institute explains that this may be because of their protein and dietary fiber, which are hunger-suppressing nutrients. Almonds are lowest in calories, with 163 per ounce, while an ounce of walnuts contains 175 calories and an ounce of pecans has 196 calories. To prevent unwanted weight gain, monitor your portion sizes when you eat high-calorie foods, such as nuts. Consuming at least five 1-ounce servings per week of nuts, such as almonds, pecans and walnuts, can lower your risk of developing Type 2 diabetes. The Linus Pauling Institute explains that the dietary fiber, unsaturated fatty acids and magnesium in nuts may contribute to this benefit. Nuts are low-glycemic because consuming them does not lead to unhealthy, dramatic spikes in your blood sugar levels. Eating nuts with other low-glycemic foods can further control your blood sugar levels. Try sliced almonds with green beans, pecan-crusted tilapia and walnuts in a salad. Almonds, pecans and walnuts are naturally nearly sodium-free, but salted nuts contain almost 200 milligrams of sodium per ounce. Choose unsalted almonds, pecans and walnuts to limit your sodium consumption and support healthier blood pressure. You get less benefit from eating almonds, pecans and walnuts when you prepare them in unhealthy ways. Pecan pie, brownies with walnuts and almond candy are higher in empty calories and sugar than plain nuts.